Lua for LabVIEW is © 2003-2016 CIT Engineering Netherlands BV. This version of Lua for LabVIEW requires a valid license on every computer it is desired to run. The license needs to be acquired from CIT Engineering Netherlands BV. You can request a 30 day evaluation license for a new machine through the same channels as the commercial use license. Each computer on which Lua for LabVIEW needs to run requires its own specific license, also when building executables. Please direct any license inquiries directly to CIT Engineering Netherlands BV through one of the means mentioned below. Mailing lists and online support forums are specifically NOT monitored for such requests! Start the License Activation dialog from the LabVIEW Tools->Lua for LabVIEW->License Info menu. If it shows the Status: Licensed you have already activated this computer for Lua for LabVIEW. Otherwise enter your user information and then press the Next button. Here you enter your serial number if you have received it with your purchase or you can leave it open and provide some other means of proof of purchase such as a PO number or similar or the invoice number that you received from CIT Engineering Netherlands BV. If you require an evaluation license please indicate so. The Installation Name: is an entry that you can use to indicate the particular computer for your own administration. Press Next to go to the Activation request screen. This is the Activation request that you need to send to CIT Engineering Netherlands BV under info citengineering.nl. You can either save the request to disk as a text file and attach it to the email or you can copy the activation request to the clipboard with the Copy button and then paste it into your email. 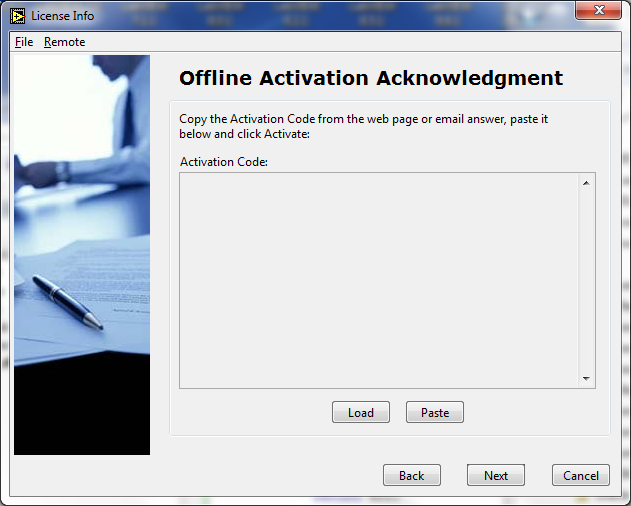 After you receive the activation acknowledgement from CIT Engineering Netherlands BV you can go to the next screen and paste the contents of that activation into the Activation Code: text box. After pressing the Next you should be presented with the initial License Information showing you a new licensed status. This is the screen that shows when your computer is properly licensed to run the Lua for LabVIEW software. There are currently three types of licenses available. You can request a 30 day evaluation license. 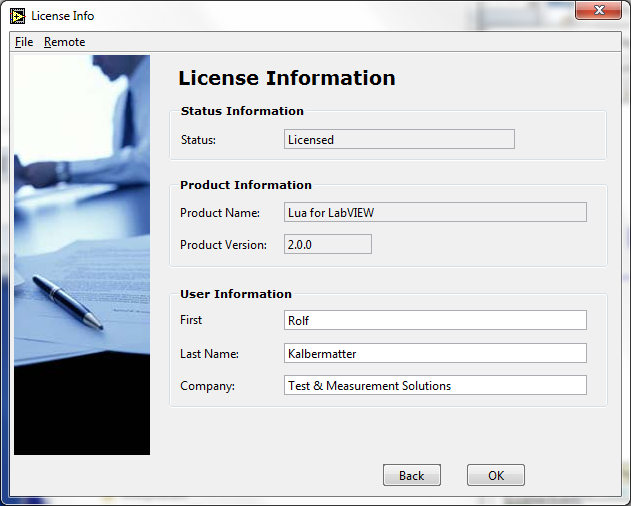 This license allows Lua for LabVIEW to run on the licensed computer for up to 30 days. After expiration of the evaluation license you need to contact CIT Engineering Netherlands BV for either an extension of the evaluation period or to purchase a valid commercial license. There are two purchasable licenses available, the first being a full development license that is needed when LuaVIEW is used inside the LabVIEW development system. This license will also allow built applications that use Lua for LabVIEW to run on the same computer. If you intend to distribute a built application that uses Lua for LabVIEW to other computers you will need to purchase a runtime license for every computer on which you want to run that built application. On receipt of a purchase order, CIT Engineering Netherlands BV will return an invoice. Until payment has been received a temporary license can be requested from CIT Engineering Netherlands BV through above explained procedure. Disclaimer: Lua for LabVIEW is provided "as is", without warranty of any kind, express or implied, including but not limited to the warranties of merchantability, fitness for a particular purpose and noninfringement. In no event shall the authors or copyright holders be liable for any claim, damages or other liability, whether in an action of contract, tort or otherwise, arising from, out of or in connection with Lua for LabVIEW or the use or other dealings in Lua for LabVIEW.